I had great aspirations of writing this early so all I would have to do is post it today, but life has a funny way of throwing a wrench into perfectly reasonable plans. My birthday is the one day a year that I can do whatever I want and not feel guilty about it, except this. I would feel horrible if I didn’t post today. I haven’t missed a Friday post since I started 17 months ago and I’m not about to miss one now! 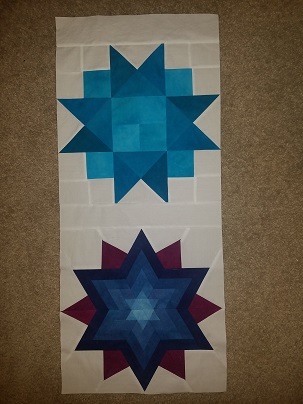 The progress on my BOM quilt hasn’t been as fast as I would have liked, but I am moving in the right direction. 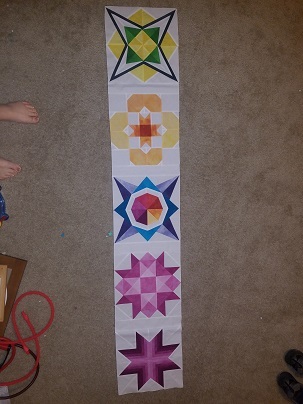 There are seven total units that make up the entirety of the quilt. I have managed to make three of the seven this week, but the final four are much more complicated and therefore take more time. I’ve managed to complete the first step of the final units, attaching one inch borders to each of the flying geese sashings. I love how much more ‘finished’ the flying geese look with the white attached to them. I’m hoping that next week I will be able to complete all four of the final units and even start assembling them all together. I was so scared to assemble just these units because I was terrified they wouldn’t fit together correctly. This is ridiculous because I measured them all and made sure they were exactly the right size, but that fear was still there and lingering over my head. Seeing them assembled in a line fitting exactly as they should has been such a relief and made me that much more excited to finish it. 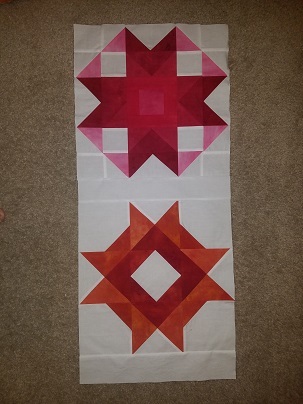 The point is (see what I did there), once I got the first two blocks sewn together and could finally see that the blunt points weren’t the first thing you see I knew that the quilt will look fantastic when it is done. 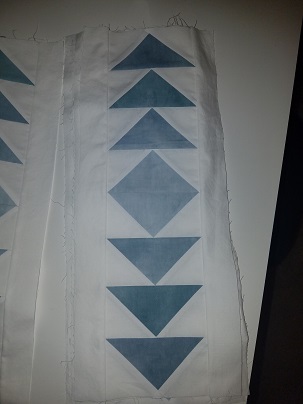 Lets bring on next week and hopefully a finished BOM quilt!